​12.5 million working days were lost due to work-related stress, depression or anxiety in 2017. Our guide aims to provide guidance on how to alter attitudes, spot the signs and tackle the issues. Mental health is now a permanent part of the workplace, with figures from the Department of Health stating that one in four of us will experience mental illness at some point in our lives. At Morson International, we have seen an increase in the number staff coming forward to express their own struggles with mental illness and seek support. This change in attitudes presented the opportunity to strengthen our own workplace priorities towards mental health by developing effective engagement strategies that tackle the core issues. In doing so, this has enabled us to attract and retain our talented people, driv­­­e productivity and innovation and reap numerous commercial benefits that set us apart from many of our competitors. 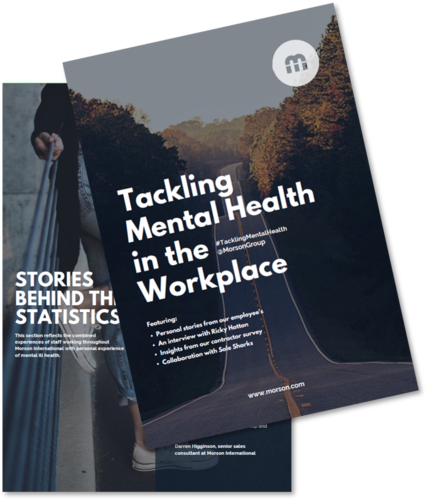 We are proud to launch this whitepaper in conjunction with World Mental Health Day 2018 and pledge our support in stamping out stigma and creating inclusive, equal and diverse workplaces.